Benedict Cumberbatch | Passing Through . . . .
With the name Benedict Timothy Carlton Cumberbatch, you have to learn to pronounce long words early on in life. Maybe that’s why, when he was cast in his first big television role, Cumberbatch could handle the most tongue-twisting quantum mechanics lectures with unruffled authority. The BBC’s excellent biopic also showcased his deft physicality, and let us glimpse the boyish warmth which he’s since kept in reserve, just in case the right rom-com script comes along. In his film debut, adapted from David Nicholls’s novel, Cumberbatch is surrounded by rising stars, both male (James McAvoy, James Corden) and female (Rebecca Hall, Alice Eve), but he’s funnier than all of them. Anyone who saw his priggish quiz-team martinet might have seen a sparkling future for him as the next John Cleese. But, with his wide-apart eyes and piscine mouth, who would have bet that he’d become a leading man? A year on from “Starter for Ten”, Cumberbatch was still well below James McAvoy on the cast list (his name doesn’t appear on either DVD box), and again he was a bullying buffoon with just a handful of scenes. This time, though, it was no laughing matter. He plays Ian McEwan’s predatory villain—who happens to be an old Harrovian, like Cumberbatch himself. There is no more detailed or authentic portrait of skin-crawling unpleasantness in recent cinema. 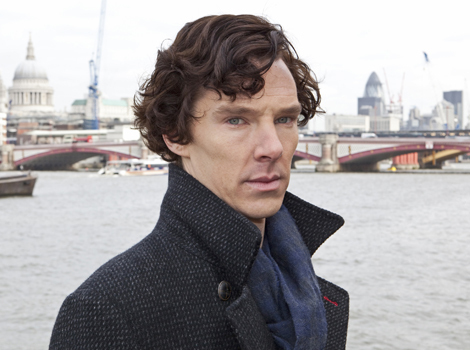 Steven Moffat’s and Mark Gatiss’s Conan Doyle update shouldn’t have worked. Sort of Victorian and sort of contemporary, usually ludicrous yet often earnest, it needed a Holmes whose laser-beam intensity would force us to take his deductions seriously, but whose clowning would reassure us that it was OK to giggle, too. Cumberbatch fitted the bill and became a star—helped, no doubt, by the piercing eyes and the clenched-fist cheekbones which left legions of fans happy to call themselves Cumberbitches. Cumberbatch and Jonny Lee Miller took turns to play Frankenstein and his patchwork progeny in Danny Boyle’s National Theatre extravaganza—a dry run for the opening ceremony at the Olympics. A cruelly cerebral scientist was hardly a stretch for Cumberbatch. But his balletic interpretation of the creature was a revelation, a feat of rubber-limbed mime artistry which showed why he was picked to do the motion-capture, as well as the voices, for two baddies in Peter Jackson’s “Hobbit”. Through five hours of torrid period drama, Cumberbatch committed himself to a facial contortion nobody should try at home: jaw jutting forward, chin hoicked downwards, fleshy lower lip furled underneath stiff upper one. But enough about his LAMDA-honed precision. His doggedly honourable Tietjens, unfurling sentences by Ford Madox Ford and Tom Stoppard, put viewers through the wringer, even as he held his own emotions tightly in check. Casting the world’s palest man as a character named Khan Noonien Singh was always going to be contentious, but even diehard Trekkies were won over by Cumberbatch’s sneer in human form. He is Hollywood’s dream antagonist: a classically trained Englishman who can deliver reams of expository techno-babble with the purring menace of a soliloquy from “Macbeth”. And, unlike Jeremy Irons or Alan Rickman, he looks as if he could beat most heroes to a pulp. A first lead role on the big screen—a spooky impression of Mr WikiLeaks, Aussie twang and all—adds to his collection of slimy brain-boxes and terrible haircuts. Next he plays a slave-owner in Steve McQueen’s award-winning “12 Years a Slave”, Meryl Streep’s put-upon nephew in “August: Osage County”, and Alan Turing in “The Imitation Game”. On the set of “Sherlock”, Cumberbatch has also been busy fending off the paparazzi, holding up scrawled signs instructing the fourth estate to “photograph Egypt and show the world something important”. So either his message gets out or they leave him alone. Smart. Congressmen running for reelections rather than doing there jobs.